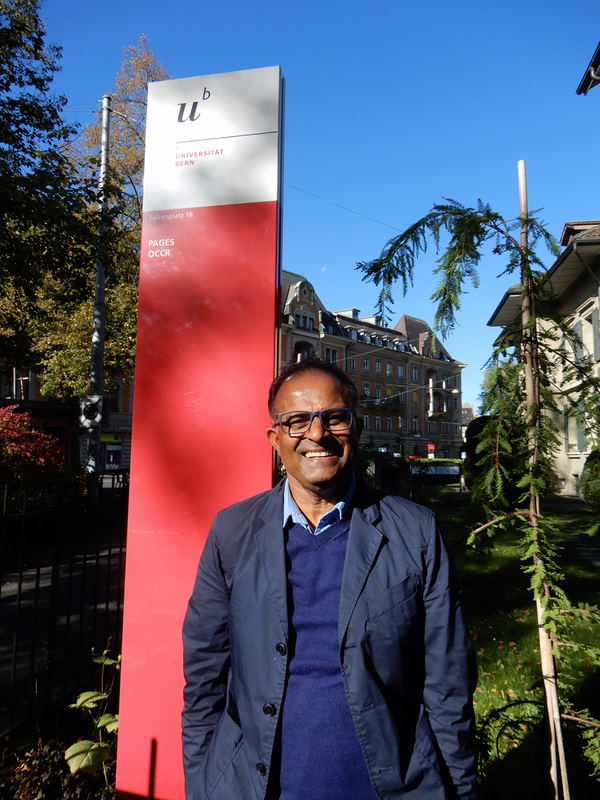 PAGES International Project Office is pleased to welcome guest scientist Professor Giri Kattel to the Bern office for the next two weeks. Kattel is in Switzerland to continue work on various Aquatic Transitions working group projects and meet with local scientists in his field. He aims to finish the first draft of an upcoming paper on the ecological resilience of South East Asian lakes, from a paleoscience perspective, during his stay. Currently a Visiting Professor under the CAS-PIFI program in Nanjing, China, Kattel is working on paleolimnology, resilience and climate change in upland and lowland lakes and floodplain systems in China. He will return to The University of Melbourne, Australia, in January 2018. One of his main projects is the National Natural Science Foundation of China's "Resilience Change and critical transition in lake ecosystem from Yangtze Floodplain" (2016-2020), in conjunction with the Chinese Academy of Sciences. "We are studying hundreds of lakes and taking surface and long sediment cores," Kattel said. "I'm supervising PhD students and postdocs jointly with Chinese colleagues on how different impacts can be detected over time through the lake sediments proxies. We are also extracting new proxies from gastropod fossils, such as freshwater snails, which has never been done in that area before." As a founding member of the newly established Resilience and Transformation Centre (RTCC) in Nanjing Institute of Geography and Limnology Chinese Academy of Sciences (NIGLAS), Kattel also collaborates on another NSFC project, "Resilience of the Yangtze River Basin". He has a PhD in Geography from University College London, UK, and is interested in water resource management, and ecosystem and food web dynamics of lowland floodplain wetlands of large river basins in not only China and Australia, but also Vietnam, Laos, Nepal and India. He has expertise in reconstruction of past environmental change of lakes and reservoirs using subfossil cladoceran (zooplankton) as indicators. Kattel is one of the co-authors of an upcoming Aquatic Transitions working group article accepted to The Anthropocene Review, a SAGE journal, which will be published soon.